Collectors know that collecting is as much about the chase as it is the catch. “The hunt,” as I’ve often heard it referred to, proves as exciting as the capture. The sentiment is probably greatly overworked. Because, truth told, few collectors would be genuinely unhappy should a collection arrive at their doorstops. Still, hunt we must, like it or not. Hitting the road in hot pursuit of the quest means going to antiques shows. Big ones. Little ones. Rinky-dinky ones. And flea markets. And estate and yard sales. And let’s not forget the thrift shops and consignment stores. Go to enough shows and one begins to wish for a statute of limitations on dealer inventory: If you’ve carted it to and displayed it at more than four shows, you must put it in auction so someone else can try selling it. But you never know where or when the great find will turn up. Here’s one I acquired more than a year ago at a junk shop. I don’t know that it’s “great” – but it is interesting. 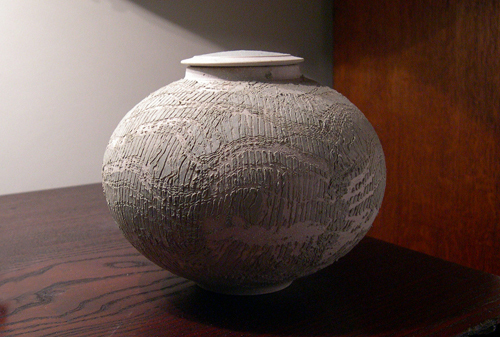 A white-colored covered bowl (or vase?). The exterior looks to have been worked with that tool ordinarily used to smear mastic on the subfloor and into which one plops the tiles or linoleum. Neither fact, though, is what drew my attention. Instead, it was what accompanied the piece: a business card identifying the maker had been tucked inside. Who cares, right? Not me. Never heard of him. It was the next line on the card that got me: 6 Laird Lane, Pittsford, NY. I know that address. It’s Frans WIldenhain’s! At least I was pretty sure it was Frans’s address. The piece was 20 bucks. I took a flyer. (I’m a sport!) Got it home, compared the card’s address to Frans’s and . . . I was right. The pot and its card each look to be 1970s vintage. Unfortunately, I’m no smarter today about Grattan Burley than I was then. I did, however, see a virtually identical piece (no business card), priced $18, at an antiques co-op. After waiting in line for a whole ten minutes to buy it, I impatiently left without it. Though I doubt this qualifies as “a great find,” it’s certainly an interesting one. Next time: Frederick Walrath’s connection to Frans Wildenhain. Can’t wait to see how this show all turns out, looks quite interesting, so I will begin to travel down the road too. The “mystery potter” discussed in my most recent blog (above), Mr. Grattan Burley, has been further identified. As the blog reported, Burley presented himself as “The Hidden Potter” and listed as his address the same one as had Frans Wildenhain: 6 Laird Lane. Helpfully, in a recent conversation, Lili Wildenhain’s son, Paul, provided additional details about Grattan Burley. Apparently, Mr. Burley, an Australian national, rented the Laird Lane studio (and, maybe, the residence), seeking to establish himself as a potter. (I am assuming this was in the early 1980s.) On his business card, his wife is presented as his publicist and agent. The extent to which Mr. Burley was cognizant of Wildenhain and his work as a ceramicist is presently unknown. Unfortunately, the pottery venture didn’t work out (i.e., was not profitable or, at least, financially sustainable). Mr. Burley became involved with the local fire department — I assume the nearby Bushnell’s Basin volunteer fire department — and, eventually, returned to his native Australia. I have just been reminiscing over my life with a work colleague and after a search on the internet found your blog. I would like to solve your mystery over my disappearance from the pottery scene. You are correct in assuming that my pottery venture didn’t work out as well as I would have liked. Lots of factors contributed to this. I lived there [at Frans’s Laird Lane home] from 1982 to 1986. I was well aware of Frans Wildenhain’s contribution to the ceramic world. It was a privilege to have worked at his studio. I was very fond of Lili she was a great source of encouragement during my time at Laird Lane. As for me, I worked at a local awning company for a few years before returning home to Tasmania. I have since been involved in several occupations but have now settled into the role of an Intensive Care nurse here in Tasmania. I hope this has thrown some light on your mystery. I recently “Googled Earth” and couldn’t see the studio. Is it still there and hidden under trees or been pulled down? Feel free to ask me anything about my time there and my work. I also worked under Burley Porcelain.